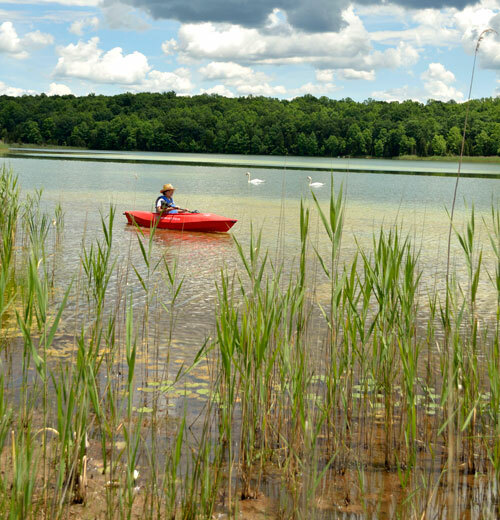 White Lake lies within the 665-acre White Lake Wildlife Management Area between Blairstown and Stillwater. The property, acquired through the state Green Acres Program is partly owned by Warren County, managed by the Division of Fish, Game and Wildlife, and enjoyed immensely by fishermen and outdoor enthusiasts. Beyond the crystal clear water and enchanting scenery, there is a story worth knowing. White Lake reveals all the layers that make a place really interesting. The swans that grace the water's sparkling surface, the feisty fish beneath, and the surrounding fields and forest are immediately captivating to the casual observer. The white streaks on the lake's bottom consist of marl, prehistoric deposits of aquatic shells. Photo by Liv Rothfuss. One of the early settlers in the Hardwick area of northern Warren County was a German immigrant named Johann Wass. Tradition tells us that he was born at sea, during his parent's immigration voyage. The year was 1764. Shortly thereafter, he Americanized his name to John Vass. Off the water's north shore stands a 200 year old farmhouse made from cut limestone, headquarters to a farm full of history. Vass started life in his adopted country with very limited means, and was, as a youth, indentured to a Hardwick citizen, Mr. Snover. He was later married... four times, which in those days didn't mean divorce, but rather indicates the short life expectancies for wives of child-bearing age. This was the case with John's choices, although they produced, for him, a total of 13 children. John Vass worked hard to overcome the adversity of his early years and finally succeeded. By the early years of the 19th Century he began to achieve financial success and status in his community. In 1802, this 38-year-old immigrant farmer's family consisted of wife Hannah, who was number three, and many children, some from previous marriages. Vass purchased from the estate of another former wife's father, Martin Swartwelder, a large farm of 550 acres with a beautiful, natural lake to its front. A log cabin supplied the housing for the large family but only briefly. Young wife Hannah passed away in 1804, and a year later, John married Margaretta Flock. She added to the group, too, by producing, with John, six more children, including son, Isaac. This Mrs. Vass lived a long and prosperous life. 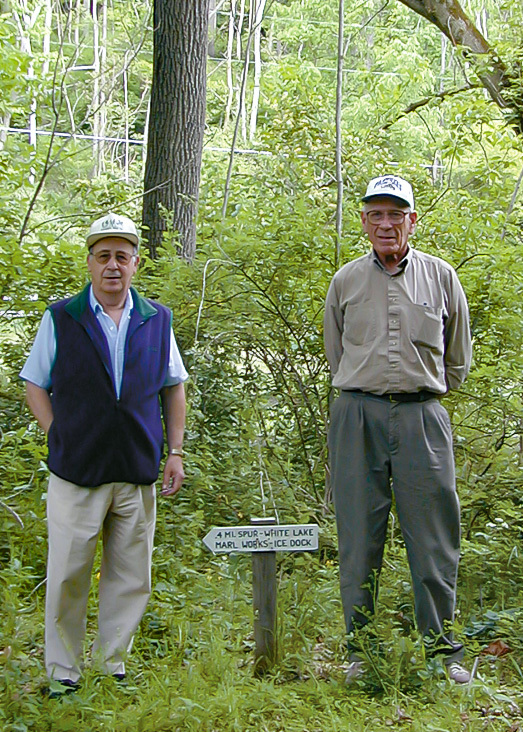 Left, author Frank Dale (r) and historian Len Frank stand at the marker for the rail spur which lead to the marl works at the lake. At the marl collecting and ice cutting factory remnants on the lake's south shore, imposing rock walls rise in the woods. Around arched brick window lintels, the wall's components, a jumble of sedimentary limestone and sandstone mixed with metamorphic gneiss indicate the glacial upheaval that occurred here. In 1812, Vass built a new home for his new and enlarging family on his 550 acres of farmland, located between Blairstown and Stillwater on the road that is today labeled Route 521. This fine new residence was a two-storey stone structure with four large fireplaces. Adjoining the spacious center hall on the first floor there were, on the right, a living room and a formal dining room. To the left of this hallway were the kitchen, pantry, a smaller dining room, and storage rooms. Two 16 x 16 foot bedrooms were upstairs, off the center hall and three more bedrooms were over the kitchen area. The kitchen and pantry, with the additional bedrooms on its second floor, were in a separate but attached wing built shortly after the first section. There was a small wooden room built off the kitchen area as an auxilliary kitchen. The residence had a porch along its entire front. The raised homesite overlooked the pond in the field in front. This body of water was early christened White Pond for the color that sparkeled up through its clear waters; the whiteness caused by white shells which covered the entire bottom of the lake to great depth. The lake discharged from its south side, and this stream made a brief trip down hill to the nearby Paulinskil River. Farmer Vass grew oats, rye, corn, buckwheat, alfalfa, and flax. He also grew and sold apples from his sizeable orchard and raised and sold pigs, sheep, and poultry. Much of the labor was provided by his young sons. In his lifetime he purchased a number of other farms in the area and, when he died, left a good farm to each of his hardworking male heirs. This mansion, lake, and land, made up the farmstead of the Vass family and was owned by three generations of them. In 1879, historian of the period, James Snell, praises the lovely edifice and lake, and tells us that, at that time, the property was owned by Isaac Vass, son of John and Margaretta. Snell describes White Pond as a "beautiful sheet of water". Son, Isaac, inherited his father's farm upon his death in 1852, at age 88. The farm and accessory sidelines functioned well, and the family prosperity was maintained. In addition to farm labors, Isaac, of the first American-born Vass generation, also involved himself in local politics. He was a constable, beginning in 1848, and later served locally as tax collector, then as a Justice of the Peace. He even ran for the State Assembly in Trenton but wasn't elected. And for a number of years he was a member of the Township Committee. At the marl collecting and ice cutting factory remnants on the lake's south shore, imposing rock walls rise in the woods. Around arched brick window lintels, the wall's components, a jumble of sedimentary limestone and sandstone mixed with metamorphic gneiss indicate the glacial upheaval that occurred here. Below: The footings for the belts that brought the marl in summer and ice in winter from the lake to the works remain. It was during Isaac's ownership that an attempt was made to start a major ice industry on the lake. The Knickerbocher Ice Company of Pennsylvania bought a small piece of lakefront property on the south shore of White Pond. They erected a formidable ice warehouse, 265 feet long, 100 feet wide, and 32 feet high. It was, by far, the largest and most outstanding structure in the area. In season, the warehouse would hold, at one time, 20,000 tons of ice. But ice production was a seasonal project, and the owners of the ice mill also processed marl, the white mineral product in the form of shells, located many feet deep, on the bottom of the lake. The shells were originally used as fertilizer, and also in big-city cesspools. And it soon became a vital additive to a new but wonderful product just coming into use, named "cement". And so the ice warehouse in winter and spring became a marl warehouse the rest of the year. For a brief period, too, the Newark Sanitary and Manufacturing Company operated at the lake's shore mining marl. This operation was aided by the existence of the New York, Susquehanna & Western Railroad which passed through the valley just south of White Pond but ran a spur to the plant itself. This activity, as well as the agricultural business, lasted throughout Isaac's life and into the ownership and operation of Isaac's son, Frank, who purchased the farm, with its reduced acreage, from his mother after his father's death in 1893. Another son, Marcus, wanted the family farm also, but was outbid by Frank. Frank managed things into the 20th Century. And at about this time, local folks changed the name of White Pond to White Lake, perhaps to attract more tourists. With the arrival of the 20th Century things began to decline. Agriculture in this hilly area of northwest Warren County could not compete with more level rich-soiled areas in the county, such as Great Meadows. And the prosperous ice production here was taken over by other, newer and larger, ice plants in the county, the Waterloo Ice Co. and the Brady Ice Company. Eventually they all gave way to the growth of ice production in the Pocono Mountains, where it was favored by the longer, colder winters. Even business at the lake suffered a setback. John Brooke and his partners, of Massachusetts, planned to open the Warren Portland Cement Company on the shores of White Lake with a production of up to 1000 barrels of cement a day. The owners of the company planned to hire 150 local workers. In June of 1900 the partners signed a contract to erect a number of handsome, stone buildings. Then, in September of 1900, before this work began, one of the partners was arrested for stealing a diamond from a nearby Newton store. The embarrassed co-partners dropped their plans and left town. 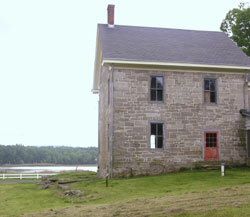 The Vass House, from rear towards White Lake. During the early years of the 20th Century, Frank Vass kept his farm active. He was optimistic and had a small house erected on the property for the future tenant farmer. Frank was also active in local politics and civil affairs and although he was not as wealthy as John or Isaac had been, he was respected and influential. But the farming business continued to decline and, in 1922, Frank Vass sold his property and home, now called "Old Vass Homestead", to local farmer George Van Riper, the first non-Vass owner of the property in 120 years. Van Riper converted the farm to a dairy operation, and made a living for 20 years. When he died in 1941, his wife sold the farm to Edwin H. Smith, a gentleman farmer who enlarged it to 700 acres. In 1958, the farm was sold again, this time to two brothers, Peter and Nicholas Kero, quarry owners and paving contractors in the area. The beautiful farm and farmhouse were bought for investment by the brothers, their new company was named the Kero-Hardwick Corporation, but they also used it for summer vacations for their families, and deer and bear hunting in the fall, for the menfolk. They eventually sold their investment, but Nicholas Kero still lives close by. The new buyer was the Curtiss-Wright Corporation who had home development plans that never materialized. This company then sold the property to the Metal Improvement Company. In 1997 the property was acquired by a combination of the Ridge and Valley Conservancy, Green Acres, Warren County, and foundation groups, deeding ownership to the Conservancy and the State of New Jersey. 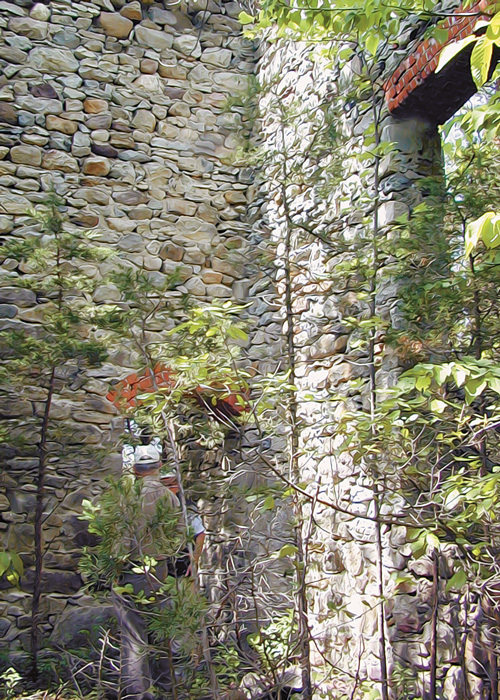 The property was accepted by the National Register of Historic Places in 1999. 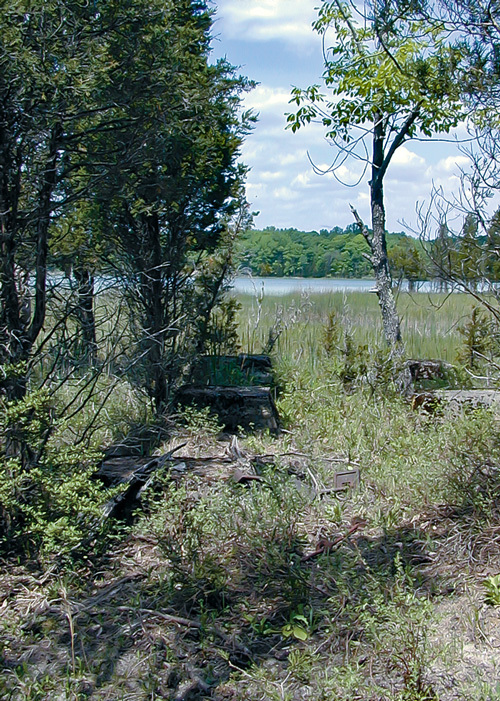 The lake site is currently used by the State Division of Fish and Wildlife for public fishing. 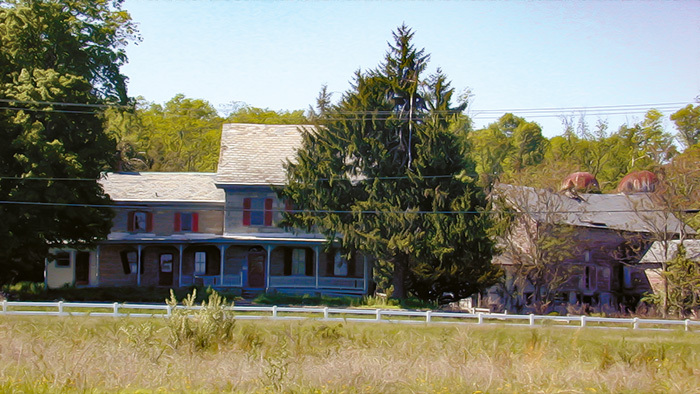 And much of the historic, proud house, has been restored thanks to the efforts of the Hardwick Township Historical Society, Warren County Freeholders, the New Jersey Office of Historic Preservation, the League of Historic Societies of N.J., Hardwick Township, and last but by no means least, The Ridge and Valley Conservancy. The future looks good.